Actually, you don’t. The same word-processing programs you use to write your documents can also be used to automatically compare them. The differences between the documents will be highlighted in bright colors. You can spend five minutes glancing through the changes and get everything back to the way it’s supposed to be. There’s even a DOS command that will do the same thing for you command line users out there. Make sure you save the updated document with a different name or in a different place, so it doesn’t overwrite your original file. 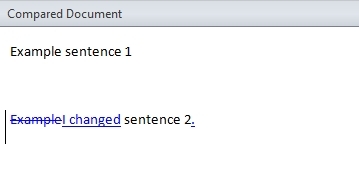 Now, open both documents in Word 2010. Go to the Review tab and click on the Compare tool. Choose the Compare… option. In the window that pops up, use the dropdown menus to choose the two files you want to compare. Open the first document as the Original document, and the new one as the Revised document. This will bring up a screen with a couple of different panels. The panel on the left shows a list of the changes. The center panel is the most useful one. It highlights every change between the two documents in blue. Words that were deleted from the first document are shown with a strikethrough, and words that were added in the new version are underlined. The two right panels show both versions of the document. Notepad++ is like Notepad but with lots of extra features. You can download it for free from notepad-plus-plus.org. Notepad++ is great for comparing files of the “text” type, like HTML files, database backup files, regular .txt files, etc. To compare two files, first you want to make sure both of them are saved with different names. Open both of them in Notepad++. Go to the Plugins menu option. Hover over the Compare option, then choose Compare again from the sub-menu. Two screens will come up, with one file on the left and one on the right. Every line that’s different will have a yellow exclamation point next to it. Specific words that are different will be highlighted in a darker color. The DOS “fc” command – short for “file compare” – will generate a list of all changes between two files. The output will show any lines that are different between the two files.